By its very nature, boxing can be a dangerous sport. Boxers have been seriously injured, left crippled for life and have even died as a result of participating in the sport and whilst there are strict rules and regulations in place with regards to safety at both amateur and professional level, there can be no guarantees that serious injuries will never occur. The majority of boxing injuries result from a blow to the head. Being punched in the head can cause major brain trauma and tissue damage. The brain is the most susceptible area to injury and other injuries include the nerves within the brain being torn, lesions, bleeding and sometimes a boxer can suffer from a blood clot forming on the brain as a result of taking a direct hit. Bones within the head and face can also be fractured. Over a sustained period, the cumulative damage of being hit in the head can cause long term effects resulting in what’s known as ‘punch drunk syndrome’ which a boxer can suffer with long after they’ve retired from the sport. Other common injuries include broken teeth and ribs, serious cuts and bruising and it can even cause internal bleeding in major internal organs. Damage to the eyes can result in detached retina and bleeding within the retina. As boxers age, they are also more likely to suffer from either Parkinson’s or Alzheimer’s Disease. 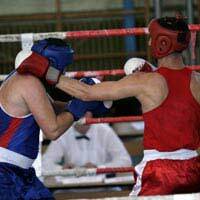 The one major difference in terms of safety precautions between amateur and professional boxing is that amateur boxers have to wear protective head guards and if you are thinking of taking up the sport, all amateur boxes must undergo a medical from their GP if their participation is going to involve competing against another opponent as opposed to using a boxing club to simply train and use the equipment. Gum shields are also worn to protect the mouth and there are protective boxes for prevent injuries occurring to sensitive areas below the waistline as a result of a misplaced (and illegal) ‘low blow’. Medical staff are also required to be at ringside to attend to any injuries that might occur and, in addition to the referee, medical professionals have the power to stop any bout if they feel that by continuing, a boxer’s health might be placed at serious risk. For many years, there have been many people, including medical experts, who have campaigned for boxing to be banned citing it as a ‘barbarous’ activity which has no place in today’s civilised society. However, counter-arguments have included the sheer number of people who enjoy the sport. In fact, many boxers who have gone on to become world champions have stated that without boxing in their lives to give them a sense of discipline, they would have most likely ended up in a life of crime. Other supporters of boxing will also point to the fact that if the sport was ever banned, it would only lead to it going ‘underground’ where issues of safety would be severely compromised and more injuries and deaths would result. The facts are that boxing not only attracts many people to participate in the sport but there are millions of spectators worldwide who enjoy watching it. All that can be hoped for is that safety remains firmly at the forefront of the sport’s governing bodies and that continued efforts and improvements are made to minimise the risks as much as is humanly possible.